Hiya! I went out last night and got back late and didn't get this post up in time! Oopsie! So I'll get two up today to make up for it and get back on track. 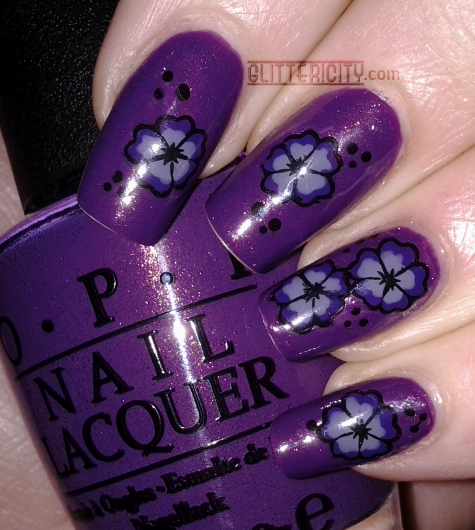 Here's my purple manicure for day 6 of the 31-day challenge! The base is OPI Dutch 'Ya Just Love OPI? Yes, yes I do. This warm, shimmery plum covered in two coats and looks beautiful! I can't believe I didn't think I needed this before when the Holland collection first came out. I found it recently and am so glad I snapped it up this time around! 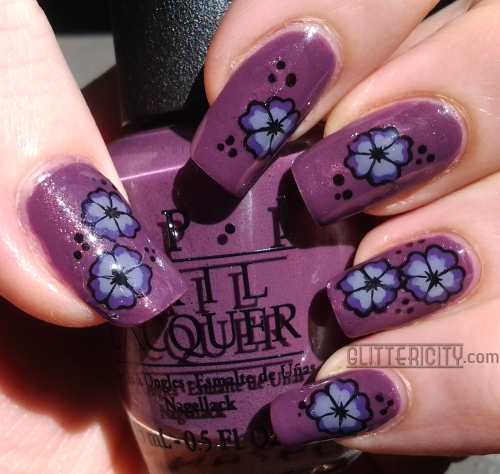 The flowers are actually stamp-decals (there are heaps of tutorials on this out there, but here's one). I make mine on a plastic baggie rather than on the stamper, because I don't want to wait for each one to dry when I'm doing a full set. I made them a while ago and had been waiting for the right time to use them. That's how I ended up with two similar manis back to back! In this case I knew for a few days I wanted to use these for purple day, and yesterday it was more that I started with just the ombre and then found the stickers later, and... yeah. Oops. But anyway, the stamp is from Red Angel plate RA-109, and I filled them in with Zoya Caitlin (lighter, dusty purple) and Orly Charged Up (darker purple). The dots aren't part of the stamp--I just popped them on to add some more detail to the design. I adhered the decals with a layer of Seche Vite, and topped them off with another coat.